Big Road Blues Discussion Forums • View topic - Pedalboards. For a long time I hadn't used any pedals but a year or so ago I got a Tech 21 Blond that allowed me to get the same creamy cranked tone out of my 5e3 or 5f1 at waaay lower volume. That means more quality playing time into the wee wee hours without the cops showing up. Got this beautiful tweed board the other day from West Coast Pedalboards. Ever 'thang I need and nothin' I don't. When I do get to crank the tweeds, I bypass the Blonde and use the Micro Amp for lead boost. Now what y'all got on the floor? That tweed pedal board case is "a real sweet candy bar"!...and a voodoo lab power brick! !...life is good! Very sweet indeed and dead quiet ta'boot. And the Blonde through the Carbon Copy is pure tweed fatness. Hey there Blues amigo's, heres my late reply, to show you my pedal board;... its now rewired with red lava cables with a new addition of a "electric toad " bomber fuzz box (Fuzz Box blues )... been away from "the road" for awhile but Im back "on the road again!!" Ps; my signal chain is tuner, compressor/sustainer, dod overdrive, bad monkey od, fuzz box, Holy Grail Reverb, morley mini volume pedal. 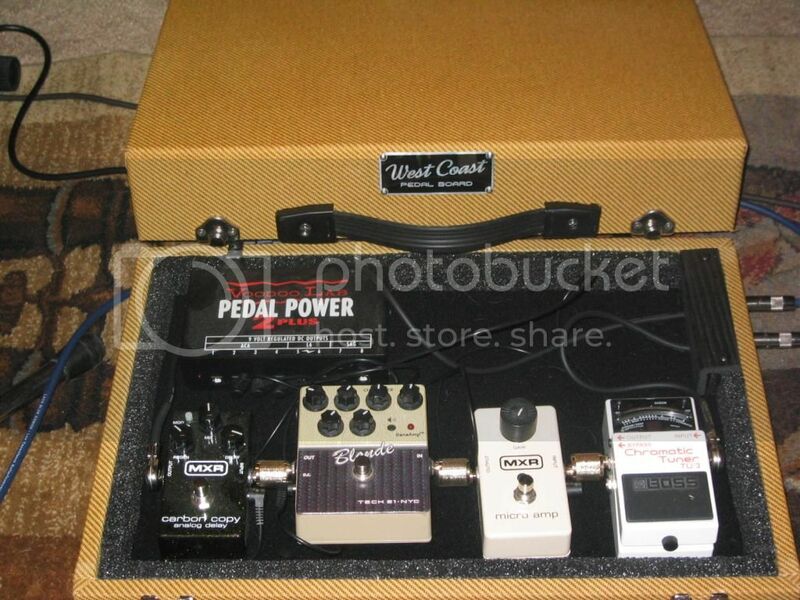 all this fits on my pedal train Jr.
since they called 'pedal' boards I guess you all push the buttons with your feet? but even then, sure you could push the buttons, but it would seem mighty hard to turn the knobs with your toes. Please tell me I got it wrong and that truth is use have to use your fingers to turn the knobs. I never seen a pedal board in person but I did used to use a foot switch dannylectro echo effect when the amp's reverb was not working. But I must confess I turned it on with my finger cuz I thought it would break if I stepped on it. But all those things in that suticase, man you guys are not just musicians you are also technicians operating that configuration it is amazing how that does not seems to distract you from your playing. For me just all the knobs on the amp are almost too much, I could never master playing a guitar and pedal board at the same time.